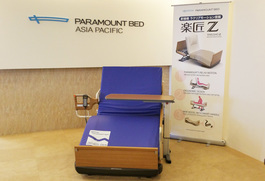 Introducing the Rakusho Z Series, Paramount Bed's all-new home-care bed that aims to support independent care of the elderly or patient who is recuperating at home. The Rakusho Z Series incorporates more than 20 years of technological know-how and ideas that have grown and evolved from the very same product series. With the Rakusho Z, the elderly or patient can be cared for with greater ease and efficiency by the caregivers. Paramount Bed is a leading hospital bed manufacturer and an advanced healthcare technology company with an established reputation in the medical field. Paramount Bed has a strong global network that caters to the needs of clients all over the world. Following the Japanese tradition of premium quality and design, we provide a broad range of beds, medical equipment and accessories that are regulated in Japan. View the various bed models and accessories available in our Singapore office. Need help on deciding which bed best suits your needs? Contact us by phone or email and we will be glad to assist. You can also send us your feedback or query using our online contact form and it will be forwarded to the specific departments directly.